Multi-view learning has been explored in various applications such as bioinformatics, natural language processing and multimedia analysis. Often multi-view learning methods commonly assume that full feature matrices or kernel matrices for all views are available. However, in partial data analytics, it is common that information from some sources is not available or missing for some data-points. Such lack of information can be categorized into two types. (1) Incomplete view: information of a data-point is partially missing in some views. (2) Missing view: information of a data-point is entirely missing in some views, but information for that data-point is fully available in other views (no partially missing data-point in a view). 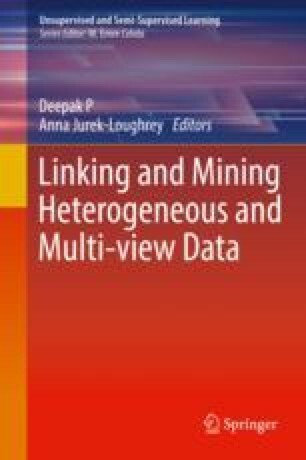 Although multi-view learning in the presence of missing data has drawn a great amount of attention in the recent past and there are quite a lot of research papers on multi-view data completion, but there is no comprehensive introduction and review of current approaches on multi-view data completion. We address this gap in this chapter through describing the multi-view data completion methods. In this chapter, we will mainly discuss existing methods to deal with missing view problem. We describe a simple taxonomy of the current approaches. And for each category, representative as well as newly proposed models are presented. We also attempt to identify promising avenues and point out some specific challenges which can hopefully promote further research in this rapidly developing field.